How can I determine if I’m Gluten Intolerant in Plano TX? If you are experiencing any of the symptoms listed above, then you should see your doctor to discuss your symptoms further. While it’s good to be aware of the symptoms and causes of gluten sensitivity, it is best not to self-diagnose a this issue. Results of diagnostic testing are more accurate if you are not on a gluten-free diet at the time of the testing. Blood test. While there are several screening blood tests for celiac disease, the most commonly used is the tissue transglutaminase antibodies test. Try a gluten-free diet. You’ll need to eliminate 100% of the gluten from your diet for 90 days, and then eat gluten after that time period and see what happens with your symptoms. If you have been diagnosed with Celiac disease, you will need to be on a gluten-free diet. This is the only way the disease can be managed. Non-Celiac Gluten Sensitivity (NCGS) – This condition describes those individuals who cannot tolerate gluten and experience symptoms similar to those with celiac disease, but yet who lack the same antibodies and intestinal damage that is seen in celiac disease. Those with NCGS share many of the same symptoms as those with celiac disease including some non-GI symptoms, such as headaches and joint pain. For those suffering from NCGS, removing gluten from your diet can help alleviate these symptoms. What is Gluten Cross-Contamination in Food? This refers to the contamination of your gluten-free food with gluten in quantities enough to make people who are sensitive ill. Many restaurants offer gluten-free food choices. However, they sometimes do not separate the food prep areas, cooking utensils and containers used to prep and cook the food. For example, a toaster used for gluten-free bread and regular bread is a major source of cross-contamination. This lack of separation can result in gluten being unknowingly added to food that is intended to be gluten-free. While many people feel that there seems to be a “gluten-free craze” right now, there has also been a significant increase in the number of patient’s diagnosed with Celiac disease and gluten sensitivity. If you are experiencing many of the symptoms commonly seen with celiac disease, you should undergo testing to determine if you are affected. If you are gluten intolerant, your quality of life may drastically improve with changing to a gluten-free diet. 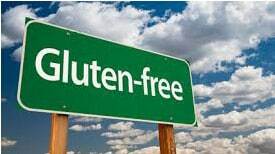 Although difficult, dealing with this disease has become easier over the past few years with the increased availability of gluten-free products and large number of restaurants offering gluten-free menu items.